A new state-of-the-art Jim Duncan track at Drake University is being installed by Kiefer USA this summer. The new surface being installed is the new Mondo Super X 720, which will be placed upon the existing track. 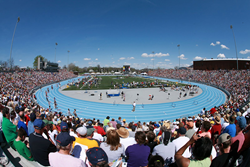 Drake University's iconic Blue Oval is undergoing a facelift this summer. A new state-of-the-art Jim Duncan track is being installed by Kiefer USA of Chicago, Illinois. A new Mondo Super X 720 surface is being installed by Kiefer USA, guaranteeing that the Jim Duncan track remains a World Class Venue for years to come. Mondo is the official Track and Field surface for this years 2016 Olympic Games in Rio. Designed to produce superior athletic performance, the Mondotrack surface delivers the optimum blend of energy return and shock absorption for both sprinters and distance athletes. Completion of the new Mondo Super X 720 surface is scheduled for late July. Kiefer USA prides itself as an industry leader in the supply and installation of sports surfaces. Whether your new or existing facility requires artificial turf, wood flooring, rubber flooring or a quality commercial floor, Kiefer USA has a proven solution to all your needs. Mondo Track & Field is famous for its surfaces and for the most innovative and fastest track in history. Mondo tracks, installed in over 1100 sports facilities, have seen over 250 world records broken and have hosted the Olympic games since 1976.